Mention the city in the middle ages, and you likely either conjure images of streets awash in faeces and offal, or of a cosy collection of quaint houses reminding people of gallant knights and ladies. Even though cities harking back to medieval times have been a staple of fantasy games ever since the inception of the genre, they usually do little to challenge the clichés presented by Renaissance fairs or grimdark pseudo-realism. To make things worse, those sterile spaces function primarily as pit stops for the player, a place to get new quests, to rest, or to trade. It’s difficult to imagine everyday life in those places once the hero is out of town. They’re little more than cardboard cut-outs (I’m looking at you, Skyrim). A handful of games, however, try to paint a more interesting picture. 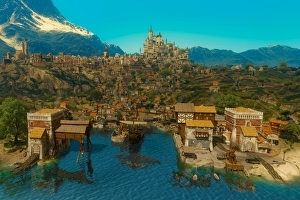 The Witcher 3 boasts a handful of cities that would be exemplary in any medium, but, being found in a video game, have the additional advantage of being able to invite players to intimately explore and study them from every angle. Cities like the central European Novigrad or Oxenfurt, or the Mediterranean Beauclair are vibrant places whose fundaments are firmly grounded in the middles ages despite their more fantastical aspects. The cityscapes of The Witcher 3 resonate with illustrations from the 15th and 16th century. Good examples are the Nuremberg Chronicle or the Civitates Orbis Terrarum (Cities of the World), a large collection of engravings of cities from all over the known world created by the cleric and geographer Georg Braun and artist Franz Hogenberg. Some of these depictions function as maps, but most simply try to capture the character of a given city, showing it from a low bird’s eye view that creates a strong profile and a sense of totality. They’re flattering views that emphasise a city’s verticality, that is its countless towers of fortifications and cathedrals that emerge in the profile, as well as the way those cities have grown out of or into their natural and agricultural environments. Often, people in colourful attire linger in the foreground, giving both a heightened sense of scale as well as an impression of everyday life in these places.